It is a huge privilege to have been elected Chairman of the British Cattle Breeders Club. I very much look forward to the year ahead building on the success of the recent 70th Anniversary Conference which was very inspiring and insightful particularly for the next generation of farmers, breeders and scientists. The future of our industry is in their hands and it was clearly demonstrated by the passion, enthusiasm and positivity by both the speakers, conference attendees and the members. Continuing to evolve and strengthen co-operation will be vitally important in light of increasing pressure on the livestock industry from recent negative campaigns via social media and other channels. As we look to the future we must continue to focus positive attention on the cattle breeding industry that not only strives for high levels of animal health, welfare and production efficiency but also aims to deliver high quality and nutritious animal protein products. 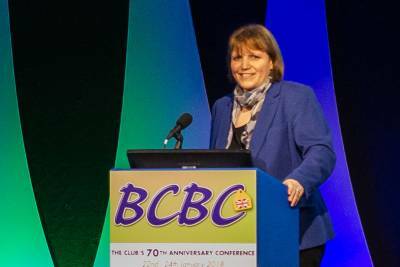 As the BCBC committee prepares for the forthcoming year’s events, we will be fully aware of these challenges and opportunities that lie ahead in cattle breeding and genetics. We will continue to secure speakers who will be informative, thought-provoking and challenging in order to present to you the latest developments whilst, promoting our strengths and unique benefits of our industry. 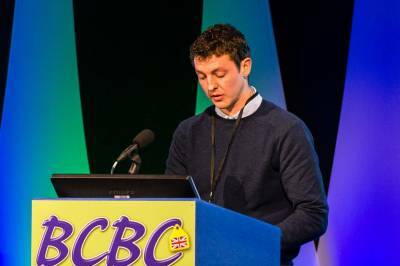 Farmers, researchers, students and the agricultural industry continue to support the BCBC engaging in lively discussions and embracing the opportunity to inform themselves of the latest developments in research, technology and best farming practices to enhance the future of UK cattle breeding and genetics. I would urge anyone with an interest in the UK cattle industry to join us – the annual Club fee is only £35 and offers discounts for our annual two-and-a-half day conference, access to the conference reports, talking slides, farm walks and a quarterly magazine - offering great value for money. I am really looking forward to welcoming and meeting you at our 2019 conference. The key themes for the beef day included breeding for success, embracing EBV’s and Genomics. Two interesting papers updated us on the value of focusing on these criteria in the beef herd. Health and fertility are key to breeding for success, determining output and ultimately the profitability of suckler cow herds. 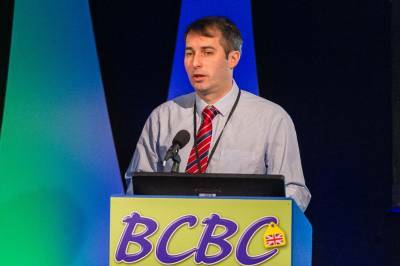 Delegates were informed of recent statistics relating to suckler herd fertility within the BCBC beef day programme. Professor David Kenny’s presentation tackled the issue of suckler herd fertility and suggested there was significant room for improvement in suckler herds within both the UK and Ireland. National statistics published by the Irish Cattle Breeding Federation, for example, indicated that an average of only eight calves were born to every ten cows on an annual basis. Meanwhile, the figure for calving interval was 400 days overall and 385 for spring-calving herds. 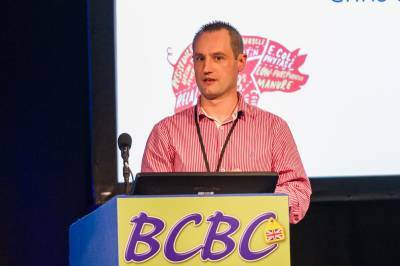 This showed that many cows were failing to achieve the key target of a 365-day calving interval said Professor Kenny, who is based at the Animal and Grassland Research and Innovation Centre in County Meath, Ireland. Statistics for the UK showed a similar pattern. “This level of inefficiency is estimated to cost Irish farmers somewhere in the region of two Euros per day; mainly in feed costs, for each day that the calving interval is extended beyond 365 days,” he said. “Calving heifers at two years is a key target for an efficient beef herd. However, only 20% have reached this goal in Irish herds within recent years. The national average is 32.5 months and the AHDB in the UK provides a similar figure. Professor Kenny covered the rearing of replacement heifers in detail in his paper, citing a study undertaken at Teagasc Grange in Ireland and funded by the Irish Department of Agriculture, Food and the Marine. It aimed to identify the effect of post-weaning management on a variety of breeds that are typically used in the UK and Ireland. The trial used a total of 320 spring born heifers, purchased from commercial herds and sired by an Angus (early-maturing breed) or Limousin bull (later-maturing breed), having been sourced from both beef and dairy herds. Varying planes of nutrition were allocated to animals within the groups, with the aim of achieving growth rates of 1kg or 0.5kgs per day. On reaching maturity, the heifers were mated using AI while at grass, over a 12-week breeding season. The results showed that dam type had no effect on maturity or age at first breeding, but pregnancy rates were higher for the dairy group, compared with the suckler-bred heifers. Heifers sired by an early-maturing breed (predominantly Angus), were younger at puberty and at first breeding, and had a higher pregnancy rate at six weeks, compared with the late-maturing (predominantly Limousin) group, but sire breed did not influence pregnancy rate at 12 weeks of breeding. While age at first breeding was advanced for heifers on the higher winter feed ration, the plane of nutrition had no significant effect on pregnancy rate after 12 weeks of breeding. An informative presentation within the beef day programme on the use of genomics within the UK beef industry, outlining progress made and the beef industry’s opportunity to add significant value. The British Limousin Cattle Society’s (BLCS) technical manager, Alison Glasgow, demonstrated how the breed was delivering opportunities for UK producers to gain additional income from the genetics of their cattle, with her presentation showing how the exploitation of added value from genetic difference had the potential to impact on all parts of the supply chain. “Across all breeds our most easily available resource, genetics, has not been exploited by the industry to the same degree as other areas of animal breeding, feeding and management. The consequence of this presents an essential and critical resource to exploit at a time when positive margins are becoming increasingly difficult to achieve through good practice alone, and at a time when market instability demands rapid response to change” stated Alison. In 2014, the BLCS adopted a long range Breed Improvement Plan, which identifies a range of key areas where investment in genetic improvement will result in a population of market-relevant genetics that deliver key income opportunities across the entire supply chain, she explained. The research also demonstrated that animals with top 1% genetics for age to slaughter have the potential to finish around six weeks faster than those in the bottom 1%, simply due to the fact they have inherited faster finishing genetics, she added. At a modest £1.80 per day finishing cost, this suggests that the faster finishing animals could be worth £80 more than their slower contemporaries. The wide use of Limousin as a suckler dam in the UK challenges the breed to deliver genetics that produce what it takes to be a productive, efficient, cost effective cow, she told delegates. In conjunction with SRUC the research undertaken to develop the GEBVs for female fertility and calf survival traits, launched last year, also revealed the opportunity to harness some added value. SRUC work has identified cost savings in the region of £42/year per cow mated from successful annual calvings. “Limousin is the primary breed in the current Beef Feed Efficiency Scheme co-funded by DEFRA and AHDB. Work on feed intake and efficiency carried out to date in the UK is suggesting cost saving advantages from feed efficient cattle in the region of £30-40 over a 180 day feeding period; around 20% of the total feed costs. “For over 20 years, the Limousin has been the single most dominant breed in the UK. It has critical mass within the sector and, as such, change at genetic level will undoubtedly make its mark. While it is unrealistic to anticipate that any sector player can capture and exploit all available benefits, adding value from genetics is clear-cut,” said Mrs Glasgow. The following two papers from the final session on the beef day sparked considerable interest, many questions and lively debate particularly from the younger members of the audience looking to set their goals and achieve their dreams. Succession, for many, is a mythical concept; farmers promise their sons or daughters that the farm will be theirs one day, but is that goal genuinely shared by all parties? Mrs Wildman asked the audience. 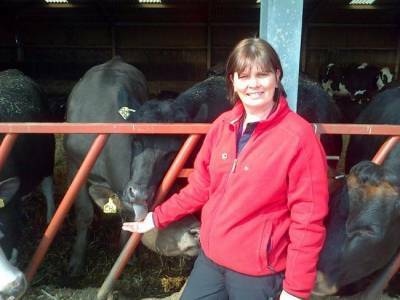 She urged farming families who are looking ahead to the older generation’s retirement not to be afraid to ask for professional help, in order to make plans for the future. Goals, dreams and ambitions should be identified and communicated clearly among all relevant family members, she said. Priority should be given to anyone who would be involved and impacted by forthcoming changes and those linked to future property ownership. “These are death, disability, disaster/disease, divorce, disagreements and debt,” said Mrs Wildman, who is the managing director of Saviour Associates advisory service, based in Dumfries. One of the first steps was to put together a financial analysis of the business; both past and present, together with a set of business projections¸ she advised. The subject of succession planning was also worthy of extensive research. Once preparations had been made, the family should schedule a series of meetings and these could be assisted by bringing in the expertise of an objective, thirdparty facilitator. “A good starting point is for each individual to set out their goals, based on their values and priorities. Then the tricky issue of the fair, versus equal, division of the farm should be addressed; this should be decided fairly early on in the process. Mrs Wildman stressed the importance of keeping a written record of meetings, with a designated individual made responsible for taking notes; again, the best person to take on this role was a third party. Meetings should be held at a neutral location, in preference to sitting round the kitchen table, she added. “I would encourage all family members to attend succession planning meetings. Feedback suggests that when family members feel excluded, relationships can be damaged as a result, although some families prefer in-laws to be excluded from the process. “There will be times when parties do not agree and it can be very helpful to have a prior discussion, to determine how any disagreements might be dealt with. Some families find that a voting process is useful, while others opt to bring in a third party mediator. “Not everyone will get what they want in a business meeting and a discussion does not always imply consensus. However, giving everyone the opportunity to ask questions and to listen to all views will help towards understanding the plan for succession and accepting whatever ultimate decision is reached,” said Mrs Wildman. The British Farming Awards, New Entrant – Against All Odds, 2017 winner Matthew Jackson gave an inspirational and compelling presentation on his journey from growing up in the city of Manchester to now, at 29 years old, living in North Wales and milking 400 cows. Mr Jackson discovered his passion for agriculture during camping holidays in North Wales as a schoolboy. At 15, he went to work on a dairy and sheep holding near the family’s favourite camp site and from there went on to find additional farm work in the area. A spell in New Zealand as a sheep shearer was followed by a return to the UK, where he met up with members of a farming partnership milking 1100 cows on a low input system near his North Wales home. “By that time, I knew that I enjoyed milking cows and I was pleased when I was offered a full-time position on the farm, on the condition that I went back to NZ and received further training,” said Mr Jackson. “I hopped back on a plane and spent six months working with a 400-cow Jersey herd on New Zealand’s South Island. It was 2008 when Mr Jackson started work on the dairy farm as a junior herdsman, expanding his knowledge by joining local discussion groups, which he found highly useful. He used his wages to buy a batch of 20 weaned heifer calves and took on the tenancy of an eight-acre area of poor quality grassland, which he improved through rotational grazing. His low-cost rearing system returned him a profit of £7,000 the following spring. Spurred on by his financial success, Mr Jackson invested the money in almost 50 weaned heifer calves and rented additional land, realising a similar level of profit per head and expanding his own business over the next few years. The inspiration provided by his visit to New Zealand then fuelled another trip to the country; this time funded by a bursary award which included a trip to Australia, where he also looked at dairy farms. On this occasion, he increased his knowledge about contract heifer rearing, share farming and cow leasing. “By 2012, I was using the information I had learned to lease-out 50 in-calf heifers for two years,” he said. “This allowed me to retain equity, while sticking to my main objective; which was to avoid becoming complacent. and 110 weaned heifer calves. Fate stepped in at this stage and Mr Jackson was lucky enough to be offered a 50:50 share farming agreement on a dairy farm. He was asked to oversee the conversion of a 100ha green field site, with the first milking taking place in 2014. The farm had 350 crossbred heifers, which were put through a 24:48 Waikato parlour, specifically designed to be operated by one-person. He currently works there alongside one full-time member of staff, with relief help during calving. Fast-forward to 2016 and cow numbers have increased to 400, with Mr Jackson describing the business as a “lean machine” which generates cash and surplus stock and allows him to think on a wide scale. His thirst for knowledge continues to drive him forward. “I have never been good at goal setting or having a vision of what our lives will look like in the future, so I took part in a course on wealth creation. This really got me thinking and completely changed my perspective on certain issues. I used to be completely driven and focused by money, whether that was right or wrong. I now know exactly what I am going to achieve and why I want to achieve it. “The course made me realise what I do and do not value, what is and is not important and how I define wealth; not just in terms of money, but also in terms of family, friends and relationships. “We are still driving on, paying debt and looking to expand. I keep an open mind to all types of systems and different formations of joint ventures, as long as they match certain criteria and do not compromise people, family time and progression. “I spent a lot of time networking in 2017 and looking for opportunities to create pathways for ambitious individuals and to offer them a stepping stone into the industry. This concept applies equally to people who are choosing to either exit or take a step back, and who would like to see their hard work being continued. “For 2018, my short term goal is to locate a second unit, as well as to be involved in other people’s progression, share the cake and give back to society. The key themes for the dairy day looked towards a profitable future with health and welfare seen as key to success and the issues surrounding genome editing. An engaging and stimulating insight to the breeding experience of Scandinavia generating a successful balance between health and production within their dairy herds. 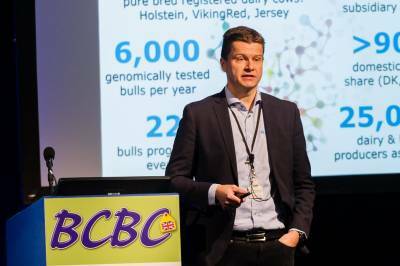 Lars Nielsen of Viking Genetics described how Scandinavian dairy farmers and the wider industry had come together, in order to cut down on the use of antibiotics in the national herd. 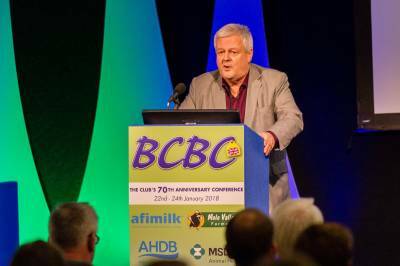 The group of countries, he explained, had the lowest recorded usage in the European Union, although BCBC chairman, Andy Dodd was quick to point out that the UK dairy industry also scored highly and was fast catching up with Scandinavia on the EU scoreboard on antibiotic usage. Scandinavia had achieved these results whilst maintaining the figures for the highest 305-day milk yield per cow within the EU, said Mr Nielsen. In Sweden, the average cow yield was almost 9,800kgs, with figures of 9,705kgs and 9,542kgs for Denmark and Finland respectively. He attributed the progress that had been achieved to a breeding policy which used the Nordic Total Merit (NTM) index. It encompasses 60 sub-traits, which are then combined into a total of 14 main traits. “In the NTM index, all of the traits featured are of economic importance, with the weightings distributed 50% for health and fertility, 30% for production and 20% for conformation,” reported Mr Nielsen. Mr Nielsen provided figures related to other issues which are tracked by dairy farmers in the three countries, in order to provide information for the central database. Some 85% of the total cow population was registered to supply fertility data, while 40% contributed to the hoof health records project. A new electronic system had been created, to encourage professional hoof trimmers to participate in the hoof health scheme. Hoof trimming professionals recorded information on foot health while on farm. The data is sent automatically to a central database where participating farmers are given access. The overall success of the Nordic breeding programme was demonstrated by Mr Nielsen, who explained that in 2001, the disease incidence of cows in the recording scheme was set at 35 cases per 100 cows and by 2016 just 20 cases was achieved resulting in a 44% decrease of cases. “The strength of the registration system in the Nordic countries is that the data is based on a high proportion of cows in a variety of environmental situations, rather than simply using information from selected herds. Breeding is far more successful when a direction selection of traits is made towards targeting genetic progress, rather than simply relying on correlated measurements, such as somatic cell count, legs and feet and immunity,” added Mr Nielsen. The final three papers of the conference on the topic of gene editing ‘Ethics v. Technology’ were provocative and informative giving delegates an insight to this complex area. Professor John Dupré from the Centre for the Study of Life Sciences at the University of Exeter predicted that in the “fairly near future,” it would be possible to make significant changes to the genomes of most livestock species. These changes would be achieved with a very high degree of precision and with the “rapidly decreasing” probability of any unwanted effects. The technology being used by the majority of molecular biologists was the CRISPR-Cas9 system of DNA sequencing. The scope for scientists to affect phenotypes through genomic manipulation however, would remain highly variable. Ethical concerns had already been expressed about the use of genetic manipulation and is likely to continue. Professor Dupré felt it was important to make clear to the public the limitations and possibilities linked to both present and future developments. Media publicity had led to speculation which, in some instances, went beyond the realistic capabilities of science. “While I anticipate ever greater precision in the manipulation of genomes, I do not feel that this will lead to comparable ability to control phenotypes. Where phenotypic traits depend wholly or largely on a single gene of very large effect, it will be possible to induce or prevent this effect, but only a very small proportion of traits fall within this category”. “Traits depend on many genes and many aspects of the environment in which the organism develops, so the effects achievable with genomic editing will be quite limited. Professor Dupré cited the enhancement of TB resistance as an example of the gene editing technique. Chinese scientists added an additional copy of a gene known to be associated with high TB resistance which, further enhanced the resistance of cattle without any adverse side effects. This procedure was not expected to eliminate bovine TB altogether, but it was anticipated that the development would have a significant and positive effect in the battle against the disease. Traditional animal breeding practices had wrought many changes to various animal species and not all had had a positive effect on welfare, he pointed out, for example, very high-yielding cows, which are prone to mastitis. He added that gene editing might also address some of the current environmental concerns. Professor Dupré drew several conclusions linked to the ethical issues surrounding gene editing. “The intelligent discussion of issues raised by genome editing first requires countering of common misunderstandings of the nature of the genome,” he told the audience. “Given a realistic understanding of the subject, there should be no clear objection to the technique. Dr Chris Proudfoot, Genome editing is an "extremely powerful tool"
Dr Chris Proudfoot of the Roslin Institute in Edinburgh stated that whatever the outcome of progress on the genome editing of livestock, scientists would need to set clear goals before the first animal of its type was brought to the commercial market. The technique would need to offer clear benefits, in terms of animal welfare, the environment and to the consumer. “We need to make sure that the science behind the models is well-considered, genome editing is an “extremely powerful tool.” said Dr Proudfoot, a molecular biologist. “Due diligence would dictate that we check for possible unintended consequences of genome editing. For example, in developing pigs that are resistant to one particular disease, we must check that we have not inadvertently made them susceptible to other diseases. In many cases, Chris explained, genome editors simply accelerate the breeding process. One major issue surrounding the technique is how it will be classified by the regulators; it could be viewed either as a novel breeding technology, or as an advanced genetic modification technology. It was possible, he suggested, that the animal that was produced through the use of the scientific procedure would be regulated, and not the technology. Chris also mentioned a report published by the European Academies Science Advisory Council, which stated that livestock breeding should be governed by the same principal that had been proposed for plant breeding; to regulate the trait, as opposed to the technology. Nevertheless, he noted, the report did not confirm whether organisms produced by genome editing would be subject to the existing genetic modification controls. “The interpretation of the EU definition what constitutes a regulated genetic modification organism is not straightforward. As a result, the Council’s report will no doubt prompt further discussion as to the appropriate approach to be followed at EU level,” said Dr Proudfoot. 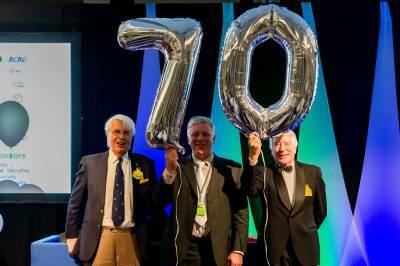 January’s conference celebrated the club’s 70th Anniversary. The Club was founded by Sir John Hammond and George Odlum, and in January 1948 the first BCBC conference was held at Cambridge. The club continues to thrive, linking practical cattle breeding with science through delivering informative and inspiring papers to the beef and dairy industry through its annual conference and digest publication. The 2018 conference welcomed delegates on this celebratory occasion, consisting of past Presidents, Chairmen, committee and club members along with future potential Chairmen and first time delegates. It was an honour to welcome two of the club’s Past President’s Henry Lewis and Dr Maurice Bichard, along with Professor Mike Coffey, the club’s current President. Henry Lewis spoke during the 70th Anniversary dinner highlighting the many milestones, key note speakers and prestigious members who have contributed to the clubs impressive history including how he himself became involved. Henry concluded by urging delegates and members to continue the progression of the club and the cattle breeding industry by going out into the world and continuing to promote ourselves. Professor Mike Coffey continued by congratulating the club on its continued success. Mike then reached out to the younger generation, encouraging them to grasp the opportunities in a new and exciting future for cattle breeding, genetics and technology. 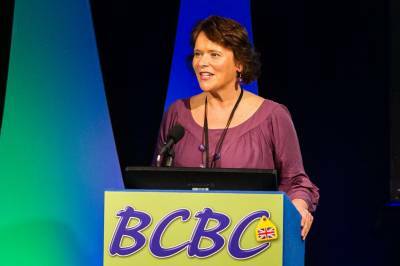 The 2019 BCBC conference will aim to capitalise on the positivity, passion and inspiration of the 70th anniversary celebrations through its world renowned forum for knowledge exchange.